Is a sense of home within us or do we need to carry it along? Would you part with a favorite object if someone wanted to buy it? I’m in the midst of a ruthless purge and have advertised some furniture on Craigslist. Among other items, I wish to bid farewell to a wood bench I’ve had nearly 15 years. Purchased to fit up a curving staircase and through a narrow doorway, I’ve assembled it and taken it apart enough times to know that I’m done with it. When it came into my life, I spent a small fortune on a custom upholstered cushion to make it comfortable. The ensemble is handsome, albeit scratched and dinged, and several people have looked at it. Without exception, they’ve also admired a chaise longue which I did not advertise. “Are you selling that?” they ask, pointing to the plush piece, contemporary yet comforting in its rust colored microfiber upholstery. It’s not advisable to fall in love with inanimate objects but I do feel an attachment to my chaise, which I’ve had fewer than five years and used even less than that; part of that time, it’s been in storage. I found it one afternoon in Boulder, after wandering into an interior design store simply because I happened to be on that side of the street. This particular piece was tucked behind the main display. As soon as I sat down, it seemed as if my perennially restless soul had found a place to land. The chaise happened to be on sale that week. It happened to be sized precisely for my Denver apartment. It happened that I could choose the color of the fabric, too. It even fit snugly in my Subaru, so I didn’t have to hire a mover. Since I wanted a more adult piece that didn’t come with the heft, price tag and ball-and-chain feeling of a couch, it was perfect. Perhaps the chaise would anchor me in a healthy way. Buying a solid piece of furniture felt like a milestone and cause for celebration. I snapped photos and e-mailed them to family. Several months later, I went with a friend to an event for creating vision boards, visual representations of what we wanted to invite into our lives in the coming year. The facilitator, a life coach, instructed us to flip through magazines and, without thinking too much, select appealing images and arrange them on poster board. It’s an intuitive process, designed to surprise and maybe unearth what we really want, rather than what we think we want. 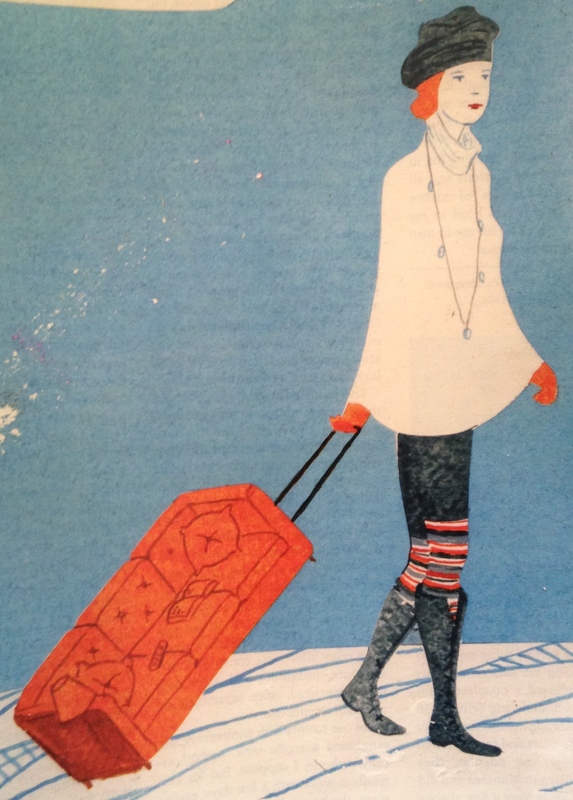 When I came across an illustration of a stylishly dressed woman towing a reddish-orange couch like a suitcase, I added it to my pile. The furniture reminded me of my chaise; the woman, unburdened by a purse, seemed to travel lightly. Perhaps she carried her sense of comfort and home wherever she is, as represented by the couch. Or maybe it was a sign that, if I were to move, the chaise would accompany me. I affixed the image to the lower left corner of my poster board. I did end up traveling, but without the chaise: when I walked El Camino de Santiago, my favorite piece of furniture went to storage, along with many other things. Last spring, before leaving for my first Feldenkrais training segment, my housemate at the time told me, eyes agleam, that if I were going to sell my chaise she’d be interested in buying it. Her forthrightness, which landed as overly eager, triggered both possessiveness and vulnerability. It was as if she had suggested buying the clothes off my back. Or, taking my inner child’s teddy bear. “I’m keeping it,” I said, since it still felt relatively new. And, I knew that someone else might have just let it go right then and there for the sake of simplicity. I paid a few young men to transport it and the rest of my belongings to a storage unit. I still enjoy the chaise. Yet, the first Craigslist person to admire it expressed an interest in buying it and most of my living room ensemble (including the bench, some rugs I wish to sell, and even a piece of my art). I hadn’t considered the possibility of a nearly complete living room “transplant” yet I felt simpatico with this woman, a fiber artist in her late 60s or early 70s. When she told me she had moved 50 times in her life, a number that makes my own address changes seem tame, I was willing to consider selling her the chaise; maybe it would help her feel anchored. After pondering for a few days, I called her to discuss it. Alas, her eyes were larger than her budget, but she put the idea in my head to possibly sell my chaise before I’m truly done with it, simply as a spiritual practice. Other people have asked about it since then. Each time, my gut grasps and tightens, as if selling it would be a huge deprivation, a net loss. Perhaps it’s because I don’t feel the right connection with a potential buyer. Still, I wondered: Would I be able to get another, if I let it go and regretted it? The store I purchased it from has since closed. The line is designed and produced in Canada, with representatives on both coasts. With shipping, a replacement would be double what I paid. The voice of scarcity urges me to keep it. And then I zoom out to my wiser self, the one who knows that some of my happiest moments have had nothing to do with furniture or sitting or even being indoors. It might be logistically simpler to let it go now, along with other things I’m selling, rather than hanging on. Does life want me to pull up this particular anchor? I’m not sure; I will sit on it some more. « When Things Come to An End. Finally. Keep only what you love! Otoh, if it opens up some space it could be refreshing.